Fifty-fifty is an installation and conversation conceived by Dr. Marsha Pearce in collaboration with Medulla Art Gallery, Trinidad. The title is taken from Caribbean artist Wendy Nanan’s talk, which she gave at Medulla on April 22, 2016. “Your reaction is just as important as my reaction…Fifty per cent of the work is your response,” says Nanan. 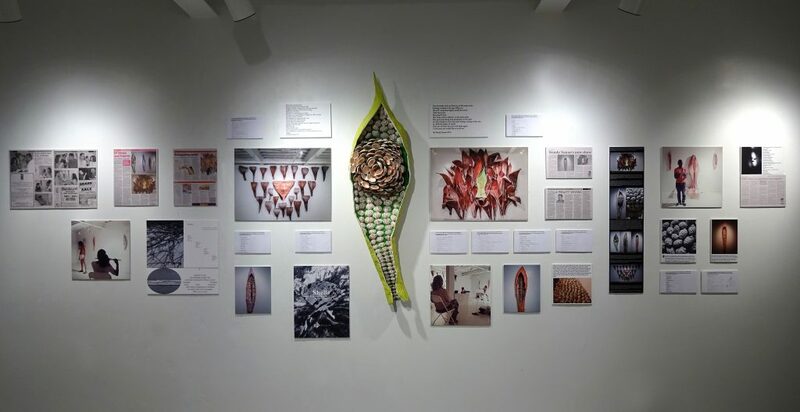 Dr. Pearce’s “Fifty-fifty” project aimed to stimulate thought on creative practice and the value and nature of responses to art in Trinidad and Tobago. The art installation (comprising newspaper clippings, online reviews, artwork by Wendy Nanan, poems, social media responses, video and a sound recording) was open to the public from June 1 – 8, 2016 at Medulla Art Gallery, 37 Fitt Street Woodbrook Port-of-Spain, Trinidad. The conversation was held on June 7, 2016 with invited panelists: Edward Bowen, Adele Todd, Andre Bagoo, Richard Mark Rawlins and Alicia Milne. A segment of the fifty-fifty installation (2016) by Marsha Pearce. Fifty-fifty installation (2016) by Marsha Pearce. Wendy Nanan’s new works exhibited between April 7 and May 5, 2016 at Medulla Art Gallery stimulated a range of responses: Andre Bagoo’s poetry published in a chapbook, his performance of that work in collaboration with dancer Mikyle Chaitsingh and flautist Martina Chow, Bagoo’s review of the show and Sharda Patasar’s reflections in the Newsday, Raymond Ramcharitar’s commentary in the Trinidad & Tobago Guardian, Marsha Pearce’s think piece published via the ARC Magazine online platform, Patricia Mohammed’s written analysis for the Sunday Guardian, David Cave’s feature in the Trinidad Express and Jacqueline Bishop’s article for The Huffington Post. Photographs of Nanan’s work, which were circulated on social media also spurred Puerto Rican poet Loretta Collins Klobah to compose verses. Nanan too, was inspired. She reacted by creating poems of her own. In addition, she invited viewers to name her various works on display, in a move that elicited pages of proposed titles. This varied output constitutes a body of work that extends beyond Nanan’s efforts with papier mâché, shells and palm tree pods. What value do we give to responses, as part of creative acts in Trinidad and Tobago (T&T)? What are the materials – the attributes – of response? What kinds of responses matter? Is “making the papers” enough? Whose view counts? Is there a desired spectator; a desired eye? If, as Duchamp observed, “Millions of artists create; only a few thousands are discussed or accepted by the spectator and many less again are consecrated by posterity” then, whose work gets discussed? Which works are accepted? Why? Which artists are likely to be “consecrated” in a T&T art-historical canon? The installation “fifty-fifty” takes its title from Nanan’s perspective on the input of viewers in making art and gives focus to a play of power in creative practice. Do artists and audiences in T&T acknowledge an equal share in creative work or is a greater percentage of that labour enacted by the artist? The installation is, in part, a call and response map, which charts Nanan’s creations (the call), together with clippings of the responses generated. This map is put in dialogue with audio tracks of Bagoo’s recited poems and a video of the sea and horizon line at Manzanilla – a place held in Nanan’s childhood memories and a site for some of her materials for art making. 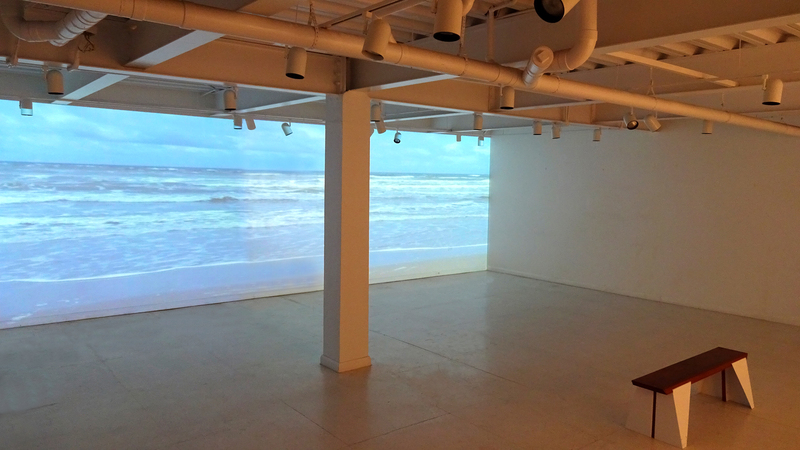 The sea horizon is a prompt for thinking about the limits/limitless nature of art while the layer of sound floods the gallery, adding to ideas of fluidity, open-endedness and boundaries. This work is itself a giant response and a call for conversation – a space of provocation for grappling with concerns about what it means to make art in T&T, about viewer responses and the creative act as monologue versus dialogue. Fifty-fifty conversation at Medulla Art Gallery, Trinidad. Photograph by Alexander Elias. This project was made possible with generous support from north eleven projection and the invisible creative. Fifty-fifty is the precursor of the Articulate CARIBBEAN series of conversations and presentations.